Tim Petrovic fired rounds of 63-67-66-70-266 for an 18-under par total and $250,000 check and finish runner to Vijay Singh's 22-under at the season-ending Charles Schwab Cup to wrap up a stellar first year on the Champions Tour on Nov. 11 at Phoenix Country Club. 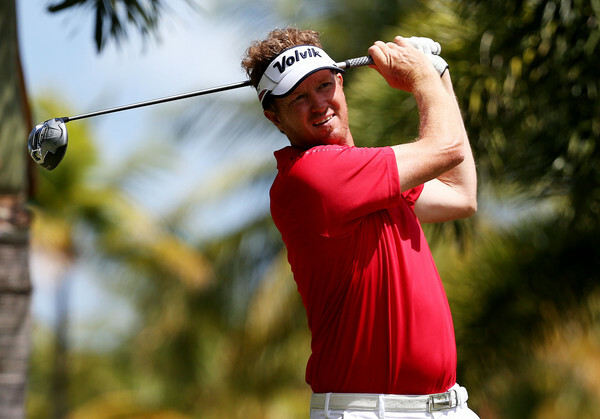 HARTFORD, Conn. – Victory continues to elude University of Hartford grad Tim Petrovic on the PGA Tour Champions. Petrovic, a native of Glastonbury, Conn., had a fourth serious shot at a title this year on Sunday, but World Golf Hall of Famer Vijay Singh made 10 birdies in a closing 10-under-par 61 that tied the course record and was his best on the Champions Tour by two strokes in the season-ending Charles Schwab Cup Championship at Phoenix Country Club in Phoenix, Ariz.
Singh finished 72 holes at 22-under 262, four better than Petrovic (70) and five ahead of Wes Short Jr. (69) and third-round leader Scott McCarron (72). Woody Austin, winner of the 2004 Buick Championship, now Travelers Championship, birdied six of the first eight holes and the final two to close with 64 and tie for fifth at 268 with Stephen Ames (72). Singh, who started the final round six strokes back of McCarron, notched his third victory of the year to vault to seventh on the final money list with $1,698,952. Bernhard Langer, inducted into the World Golf Hall of Fame this year, shot 67 to tie for 13th at 273 but won a record fifth Charles Schwab Cup title and a $1 million bonus. He had two wins this year and finished first on the money list with $1,222,154 and had 2,525,404 Charles Schwab points. 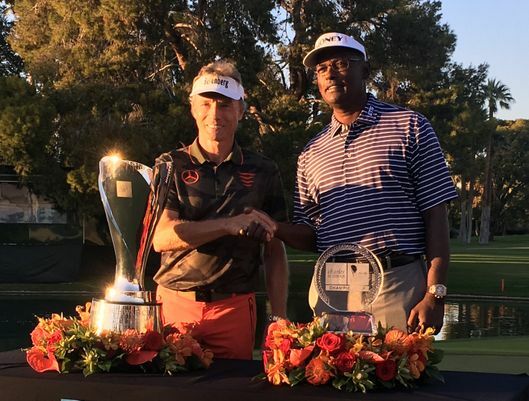 Two hall of famers, Bernhard Langer (left) and Vijay Singh (right) celebrate victories at the Charles Schwab Cup Championship at Phoenix Country Club on Nov. 11. Petrovic began the day one back but made an eagle 3 at the first hole to become the first player to get to 19 under. But he bogeyed Nos. 4 and 5 and inexplicably missed a 12-inch birdie putt at No. 7. He rebounded with a birdie 2 at the eighth hole to shoot 1 under on the front nine and make the turn tied with McCarron. Singh, meanwhile, had made five birdies in his front-nine 31 that got him within a stroke of the lead at 17 under. Petrovic regained the solo lead with an 8-foot birdie putt at No. 10, but Singh took the lead for good with his sixth, seventh and eighth birdies of the day at Nos. 12-14 to get to 20 under. Petrovic missed makeable birdie putts at the 11th and 12th holes and then hooked his tee shot on the par-313th into a gulley left of the green and failed to make a 15-foot putt for par to fall to 18 under. Singh then all but settled matters when he got a major break at No. 16 as his drive right into the trees stopped in an opening, allowing him to run a chip onto the green. He then capped his good fortune with a 30-foot putt for his ninth birdie and a three-stroke lead over Petrovic at 21 under. Petrovic rebounded with an 18-foot birdie putt at No. 14 to get to 19 under, only to have Singh respond with another 30-foot birdie putt at the 17th to regain his three-stroke lead. A routine par 5 at No. 18 clinched Singh’s record-setting day and third Champions Tour title this year. Petrovic bogeyed No. 17 after hitting his drive into the water and missed a 6-foot birdie putt at the 18th but finished second when McCarron made double-bogey 6 at the 17th after also driving into the water. He had birdied the 13th and 15th holes to get within a shot of Petrovic. Petrovic regained his playing card last year when he finished fourth at 17-under 267 in the qualifying school finals in Scottsdale, Ariz. He had played on the 50-and-over circuit for 18 months after 15 years on the PGA Tour, where he earned $12.2 million and won the 2005 Zurich Classic of New Orleans. Petrovic’s best finishes this year included second in the KitchenAir Senior PGA Championship, a tie for second in the U.S. Senior Open, Sanford International and Chubb Classic and a tie for fifth in the 3M Championship. 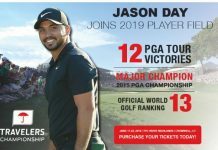 In the first two playoff events, he tied for 23th in the Dominion Energy Charity Classic and tied for 44th in the Invesco QQQ Championship, but he saved his best for last to cap his best Champions Tour season, finishing ninth on the money list with $1,463,808 and the Charles Schwab Cup standings with 1,742,048 points. Jerry Kelly, who was Petrovic’s teammate at the University of Hartford, closed with 69 for 272 and 12th place. He won the first event of the year, the Mitsubshi Electric Championship at Hualalai, and then tied for second in the Cologuard Classic. 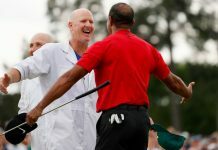 He finished fourth on the money list with $1,922,495 and sixth in the Charles Schwab Cup standings with 2,020,638 before having knee and elbow surgery this week. But it was an especially memorable year for Petrovic. Two weeks after qualifying for the Champions Tour, he was inducted into the Connecticut Golf Hall of Fame with Malcolm McLachlan, who has worked for the Connecticut State Golf Association for 28 years, the last 15 as Director of Rules and Competitions. McLachlan also has been involved with the USGA for 15 years and dedicated to furthering Rules of Golf education and awareness. He was part of the founding family at Ridgewood CC in Danbury, where the Hall of Fame inductions were held in conjunction with the CSGA annual meeting. Next articleCallaway Golf: Big Bertha is Back!